Technology progresses fast and the last decennial we saw all kinds of new technology (SMACT) which increasingly raises the topic of ethics. People see challenges in using these new technologies from several perspectives. There is the perspective of privacy; what are the consequences of collecting data with my wearables? These wearables help me to collect my running data, but what if the insurance company can track me too? Then there is the perspective of humanity; if AI can make autonomous decisions, what does it mean to the position of individuals if algorithms proof to build up biases? And like in other industrial revolutions there is a perspective of employment opportunities; smarter computer systems take over our jobs What skills and competencies do we have to develop to give meaning to our existence. And there are more perspectives that raise all kinds of ethical questions. 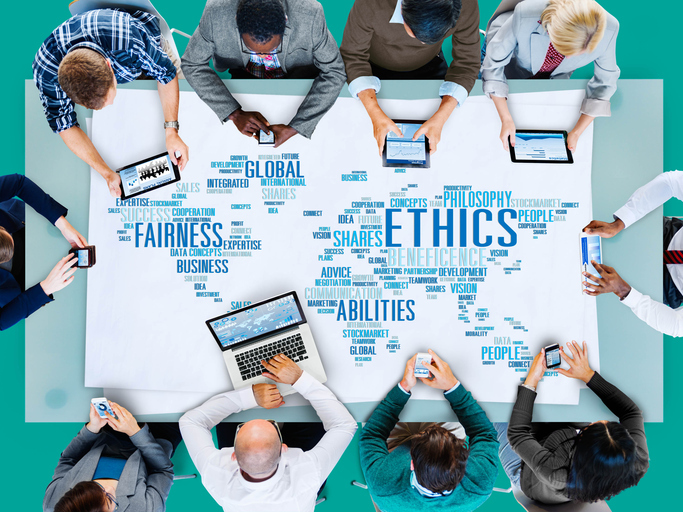 There are a lot of articles that warn us for the possible consequences of decisions if we do not approach them with an ethical view, or they just present cases where it went wrong. In the mean time we rely on law and regulations. But law and regulations can’t anticipate situations that result from rapid innovation: We’ve all heard how Facebook started a charm offensive to save their image after some privacy scandals opened our eyes. The GDPR law was a couple of years too late to prevent this. Is there another way to prevent this? Can we build in ethics from the start of innovative ideas? 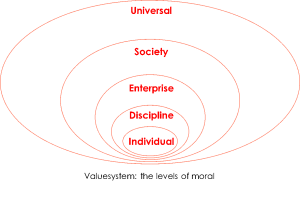 To my opinion there is a relatively simple way to include ethical thinking in the life cycle of innovation. The condition to make this work effectively is to include ethical thinking from the start of the life cycle and include the results in our architectures. In March 2018 at our annual DYA event, the architecture event of Sogeti in the Netherlands, I spoke about the relation of architecture and ethics. It has been said before: technology is not neutral. But that doesn’t make technology itself unwanted: We must be critical in how we design new applications with it! Ethical questions arise when values and norms of individuals or groups of people don’t match their context anymore. In other words when their experience and conception are put to the test. People judge situations against moral values. Moral values drive the way we act. We can distinguish values on different levels according to the value system. If we want to judge the desirability of a design decision we must know the values on each level in the value system to test its effect. What is acceptable for your enterprise may be the opposite for society. As an example: When a Dutch bank introduced in 2014 to sell transaction data of accounts to advertising companies, to be able to personalize advertisement, customers lost their trust in the bank. Even though they did explain it was respectful against the customer’s privacy, several hundred customers cancelled their accounts the day the news came out. Also, the authorities started an investigation if the plan complied to law and regulations. The values in society did not match the values of the enterprise and therefore the plan was not supported. The bank withdrew their plan at that time. Take into consideration that values are culturally bound. In the Netherlands this bank-case started a national debate, that might not have happened in other parts of the world. And values change over time. Sometimes the launch of an innovation comes too soon, people need time to get used to new norms and adapt their values. This is not always a matter of months or years but can take generations. Where the safety of autonomous cars is now still under debate, it is not hard to imagine that there will be a point in time that human driven cars will be considered unsafe. To make architectural designs ethical aware we must immerse ourselves in the values of the value system. Which will be a continuous process because the values differ over regions and change in time. The rationale of each architecture decision must not only be checked against the enterprise strategy but also against the values of at least the enterprise and society, in every perspective that could raise ethical questions. To understand the moral on different levels in the value system is a complex job. But denial is not an option. Any enterprise that wants to bring meaningful innovations to their markets should start by investing their moral values and those from their context. A good way to start is by starting a dialog with the relevant stakeholders or focus groups in society where the enterprise is active. Preferably in the phase innovations are still ideas and not at the launch of the solution. Use these values as references in your architecture description: A good architecture decision is checked against the business strategy and goals of the enterprise, but an ethical architecture decision is also checked against the moral values in the value system. Transparency on how enterprises act on moral values will become more and more a distinguishing factor to win the loyalty of customers. Ton Eusterbrock started his career in Sogeti Netherlands in the role of Information Architect since 2007. Starting in this role as consultant to help clients developing architecture he developed himself as a trainer in DYA and architecture, as well within Sogeti as for clients.